Day 2: Is this real life? Ciao tutti! Just finishing up my second day in Roma and let me tell you, it is AMAZING! This weekend has been a crazy/amazing blur. First with getting to O’Hare airport and realizing I was in the wrong terminal (oops) and then being up for over 32 hours straight while trying to get through orientation and a walking tour of Balduino (our little neighborhood in Rome). 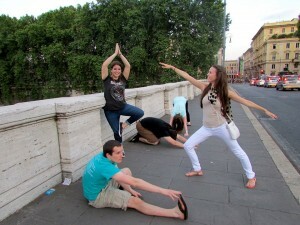 But I managed to rally for the photo scavenger hunt of downtown Rome, which was awesome! It was an amazing way to see the city and to bond with my fellow JFRC peeps. 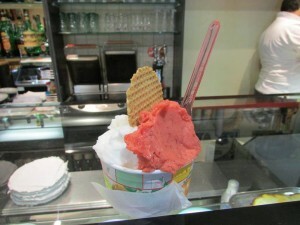 Side Note: Downtown Rome is EXACTLY like you’re picturing it! It is so beautiful that I literally felt like I was in a movie the entire time (Lizzie Mcguire anyone?). Anyway, after my insane first day in Roma I had an amazing nights sleep, needless to say haha. Today we visited Castello di Torre in Pietre, which was a beautiful castle that has a church and a cantina where they bottle their own wine. After we toured the castle and winery we had an very relaxing afternoon eating a buffet and drinking their homemade wine… absolutely divine. This weekend has gotten me SO excited for the rest of my study abroad!! Hope you enjoyed reading 🙂 Ciao for now!! My life for the next 4 weeks. Best shot from the photo scavenger hunt. Yoga anyone? The start to a perfect meal and the castle. 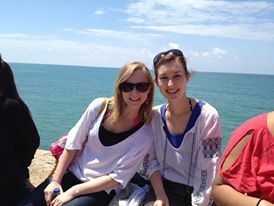 My name is Lydia Wassman and I am studying abroad for four weeks at the John Felice Rome Center! I’m going to be a junior and I am a history major with a communications minor. I’ve been in Rome for two days now. I flew in on Saturday morning and spent an entire full day doing fun activities and having a scavenger hunt in il centro (downtown). The John Felice Rome Center is located outside of the downtown area, almost like a suburb of Rome. This location is the BEST because it gives you an escape from the chaos of Rome, but is close enough to il centro that it’s only a 15 minute bus ride away. So far, I love it here and think it is AMAZING. Yesterday when I arrived was the feast of Saints Peter and Paul, who happen to be the patron saints of the city. Everything in our area was closed due to the holiday, and later in the evening there were fireworks over the Vatican and the river! It was beautiful. 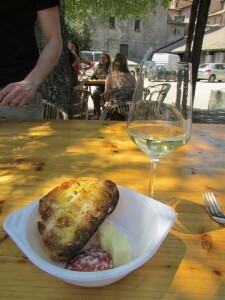 Today, we went to the countryside to a vineyard and had some delicious wine and food. It was so awesome and beautiful. I’m slowly starting to realize the challange I’m facing with this blog: I have no idea how I am going to put the experience I’ve had (so far and, I’m assuming, that I will have later) into words. Being here is a dream come true and I almost never want to leave. Italy has so much to offer in history, entertainment, FOOD! I can already tell I’m going to LOVE it here. ¡Musica! ¡Fuega! ¡La Playa! ¡Baile! My yelling of random Spanish words can be one two things. I’m either helping Pitbull with his new single or describing my night in Malaga last weekend. 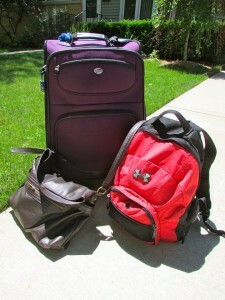 Around 4PM on June 23rd, a few of us students headed to the bus station prepared for a 3-hour bus ride to Malaga. There, we would celebrate the Night of San Juan. Each year, on June 24th, “we mere humans give thanks [to certain Pagan gods] and realize that the seasons of harder times are about to come”. While I’m pretty sure not everyone in our group understood the specific significance and goal of this night, we did pick up on some of its themes. Andalucia’s website explained, “It is about night to day; it is about fire to water. Fire purifies and water recuperates, refreshes, and rejuvenates.” Some of the activities we enjoyed that night tied into this idea perfectly. 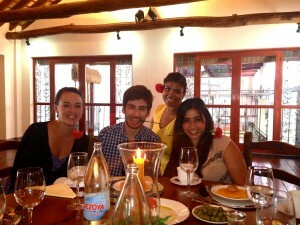 Upon arrival, we immediately dropped our bags off at a nearby hostel and headed to tapas. Sidenote: I am really going to miss tapas when I am back in America. Now guys, I usually would not blog about the fact that I ate, but this restaurant we went to was quite fantastic. At, 100 Montaditos, there are 100 options of little sandwiches you could choose from (including chocolate bread on the sandwich deserts). Usually one person will order 2 – 4. Maybe even more. Would you like to know why? Because everything cost ONE EURO! Including their sizable beers and tintos (a wine juice). My description cannot fully encompass how exciting this place is, but my friends and I highly recommend it to any visitors. 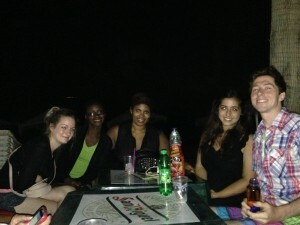 After tapas, we spent some time relaxing by the beach. From that point on our trip was absolutely beautiful. I don’t think I have ever seen the moon so close except for in Bruce Almighty when Jim Carrey tries to impress Jennifer Aniston. 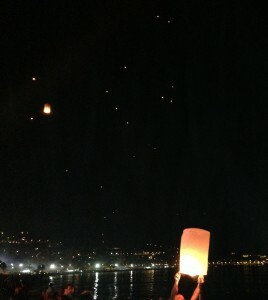 To make the night even better, hundred of people were lifting lanterns into the air to completely light up the sky. At almost midnight, we enjoyed a concert from some artist I wish I knew because he did a good job keeping the party going. Tradition says that come midnight, one needs to wash their face and feet three times to be granted three wishes and to have a happy following year. Who are we to defy tradition?! With our swimsuits on, we ran into the Mediterranean Sea at midnight, though to be honest I don’t think the girls cleaned their faces there for sanitary and anti-salt-face reasons. The next tradition of the night was bonfire jumping. It is thought “if people jump over a bonfire three times on San Juan’s night, they will be cleansed and purified, and their problems burned away.” First, we wrote down things about our lives we wanted to rid of and threw them in the fire to see the negativity burn away. Then, we jumped over fire [videos to come]. I cannot even begin to explain how real the fear was – speaking for myself at least – but I am so glad I had the chance to experience this cultural and traditional moments with my friends and the Spanish locals. Finally, we joined in on the tradition of hanging beachside, sipping sangrias/beers/mimosas/water. 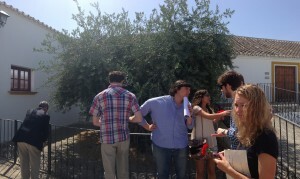 All quotations and traditional information from http://www.andalucia.com/festival/sanjuan.htm. So a lot of time has passed since I last blogged; since before I went to Patagonia and before my semester here even started! I’ve been busy and maybe I will post about all that fun stuff later, but for now here’s a note I wrote while coming back from a weekend venture to the driest desert in the world; the Atacama desert. 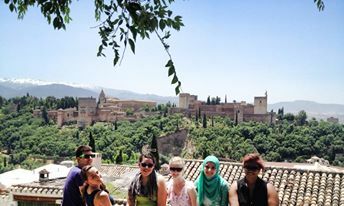 Another weekend means another weekend trip in Spain- to Granada! Granada is only a 2.5-3 hour bus ride from Cordoba and the bus here is also very inexpensive (great for college students). After arriving to Granada we made our way to Oasis Backpackers hostel (highly recommend, they have a bunch all over Europe). The streets in Granada’s city center are 98% mostly at an incline so there was quite a bit of hiking involved. 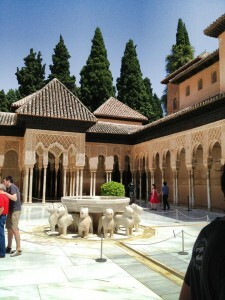 Going to La Alhambra was quite a trek but very worth it. It was the last and greatest Moorish palace. 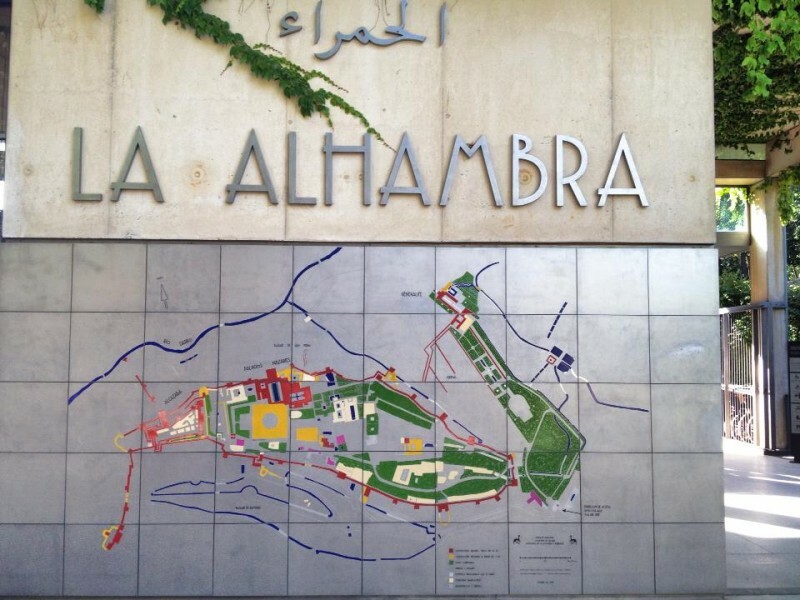 There are several parts to La Alhambra- the gardens, the palaces, and the vacation house. The kings’ palaces were majestic. They had so much intricate detail that must have taken hundreds of people to complete. The palace took us at least an hour as we were stunned in amazement, room after room. Pictures don’t capture every detail of the palace or even how stunning it is but hopefully these can give you an idea of how massive and intricate this kingdom was built. Granada also has a very lively night life because it is home to a big university (10,000 students) in Andalucia. It’s not unusual to hear people out in the streets going to have tapas or drinks at multiple bars and then going to a night club for dancing. Nothing says good afternoon like eating a kabob in Granada for lunch. I’ve never had kabobs before coming to Spain and they are magically delicious! While some of us indulged in a spectacular kabob, we trekked (yes, it was a trek) up to Plaza San Nicholas. Spain seems to have more plazas than they do churches but this one stands out for its panoramic view of La Alhambra. 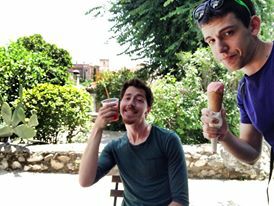 Our original plan was to check out some caves higher from San Nicholas but since the weather was a lovely 42 degrees Celsius, we opted for some ice cream or helado. Helado San Nicholas has the BEST helado and granizados (fruit slushies) in Spain. 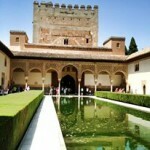 That’s a fact- if you go to Granada it’s one of two things you must visit, besides La Alhambra. After we cooled down with the best helado we have ever had the privilege of eating, we did some shopping throughout Granada’s streets. Granada is heavily influenced by other cultures so there was a lot of beautiful tapestries, beaded pillow cases and jewelry that reflected that. 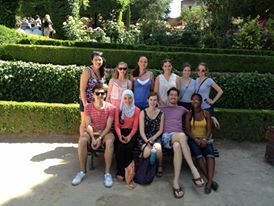 At least once a week, our group has gone on excursions throughout Córdoba and its surrounding areas. In the past two weeks I’ve seen so much more that I expected to, but last Friday, June 14th, the group headed to the place where Nuñez de Prado olive products are created. It’s difficult to fully grasp how many olives there are in this world until you visit an olive oil factory. The trip to this factory was a sight to see itself, with open lands and neighborhoods on hills, but once we reached a stretch of land with thousands, maybe tens of thousands, of olive trees, we were all in a bit of shock. For miles, we saw space solely dedicated to a food I once viewed as pizza toppings, dip for my bread, and a martini accessory. There were olive trees everywhere! 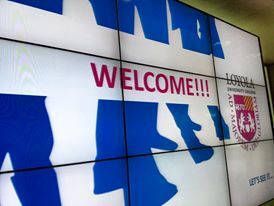 Upon arrival, we were greeted warmly my the owner of this company and given a tour of the facilities. We started in the fermentation room and made our way to an “olive oil cave”. In this space, the huge silver “vueldes” – which have been around since the 1860s – begin to refine the olive product (which is completely organic as the farm has not used preservatives since 1960). 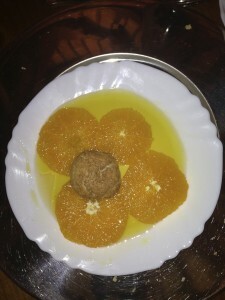 At this point, one can begin to make the olive oil or refine the fermented product into cosmetics and other non-edible products. Finally, we arrived to the packaging room (left) where five men were working to hand-seal each bottle of olive oil. The owner explained that everything is done manually here. With no computers to keep count of how much product is made or where it exports to, there is no chance of system breakdowns or information loss. This system has works since 1944. At this point, we were all amazed bythe work ethic and detailed productivity of the Nuñez de Prado system. There was even a 500-year-old olive tree on their land (right)! 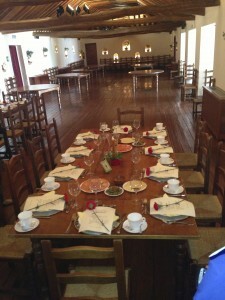 However, we were even more surprised by the fabulous meal that they served us. Our three-course breakfast included: a bread entre that could be topped with olive oil, tomatoes ham, cod, and/or Manchego cheese, fried eggs with potatoes in the style of the chef on sight, and finally an orange with olive oil, honey, and a type of sweet biscuit to satisfy those with a sweet tooth. This only further proved to me how universal this product was. You can mix it with fruit and honey and have no complaints from me. In Spain, they take their olive oil seriously. 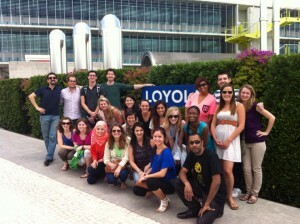 This trip gave us a point of view of how important their production is here and throughout the rest of the world. To pick up some Nuñez de Prado products, join me in Spain! – or you could find some in a local Whole Foods! When in Spain, you dance like the Spanish do! Or in our case, you attempt to dance. 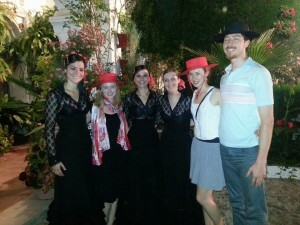 Loyola Andalucia arranged a private flamenco show for us at a beautiful outdoor patio in Cordoba. Before the show started, we received a little gift- red and black dancing hats! Needless to say, we were able to channel our inner Spanish dance moves rather quickly! 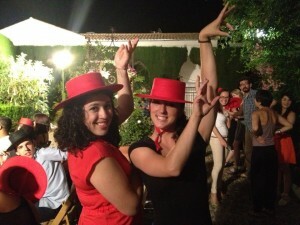 Sammy and I with our best flamenco moves! There was a woman who would sing while a couple danced and let me tell you, she had quite the impressive voice! They also had a group of young girls perform which we were told were in a class learning to dance flamenco. I think everyone was in awe with how darn cute they were dancing in their full skirts and costumes. Next we saw a few performances by an older group made up of college students who looked to be professionals in dance. One of the things I loved the most was the coordination that goes into flamenco. There are hand, hips and foot movements that are all occurring simultaneously. Also the women have to take into account their skirts which had a long train that they would just kick up or swing it back as they were spinning. To our surprise, the musicians and dancers invited some of us to come up to the patio stage and learn to dance La Sevillana. It is a traditional dance that people from this region of Spain all know- similar to how many people know the electric slide in the States. The 10 of us, who I’m sure were nervous, were each paired with a knowledgeable Spaniard who was able to guide us through the dance. This 3 minute dance didn’t make us experts but we’ve all come to the conclusion that if was an experience we will never forget. For a glimpse into our night- check out this video that Loyola student Jake filmed! 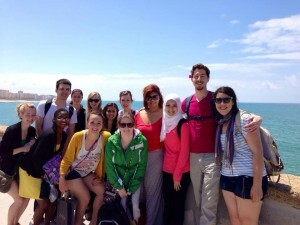 With an excursion to the Sevilla campus, a group of us decided to visit one of the nicest beaches in Spain located in Cadiz. The weather wasn’t looking so nice as it had gotten a little chillier towards the end of the week but we still made the trip to Jerez- where we were able to find a hotel for 16 people. Cadiz is a short and cheap from Jerez, about 45 minutes and 9€ round trip. The main train system in Spain is AVE which goes to huge cities in a bullet train such as Madrid, Barcelona and Sevilla (the state should really invest in this system). It’s similar to Amtrak just ALOT better and for better prices. Ave also has a shorter distance train that has multiple stops, more like the CTA train system. Cadiz is touristy but smaller so it was easier to enjoy the shops of shoes, clothing and foods. Thankfully by the time we got to Cadiz, the sky had cleared up and the sun was out- back to heat! 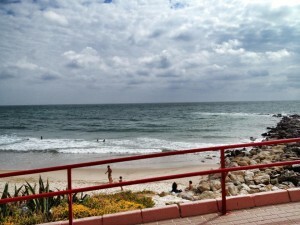 The Cadiz beach isn’t like the beaches of Lake Michigan. For one, there weren’t many people there probably because it wasn’t as warm as Spanish people are used to. That didn’t stop these Loyola students from running into the Atlantic Ocean and enjoying the waves coming in. Almost everyone experienced some sort of sunburn from that day on the beach- talk about a successful first weekend trip!! Before we headed to Cadiz, we were fortunate to get to explore the Real Alcazar which translates into a castle (think Jay Gatsby’s estate in the 15th/16th in Spain). The grounds were vast with so much detail from mosaic tiles (the Spanish are obsessed with beautiful and intricate tiles) to neatly trimmed bushes, and hand painted artwork that was nearly faded alongside the entire property. I can’t imagine how many rooms the entire place had or how many people had to work there to keep the place working. Sevilla is such a large and well known city that a few us decided it would be worth it to spend another few hours there before heading home to cordoba. After quite an AVE mess of affairs of having few trains running from Jerez on a Sunday, we managed to use our Spanish street skills to find a bus station with routes to Sevilla and then take an Ave train back to Cordoba later in the evening. The bus ride was quite scenic as we were on a highway that hardly had any cars let alone traffic compared to lake shore drive on any given day. We passed cows, horses, small towns, and fields full of sunflowers (sounds like something’s from a movie). 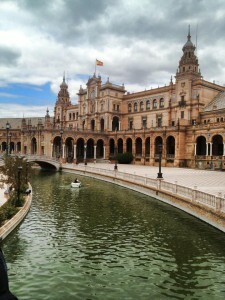 Once at Sevilla, we went to explore the city a little further at the Plaza de España. This plaza is stunning- a huge open area with so much art and mosaic images. There are several Spanish cities represented along the plaza that show something unique about that particular city and also had a map on the ground directly in front to show the location of the city. Now this is where the Spanish literature and art junkie kicks in: alongside the building were mounted at least 40 head statues of famous Spanish writers, artists and figures from the country’s history. Some of my favorites were Goya, Lope de Vega and Velazquez. In true Spanish style we finished the Sevilla trip with tapas along the Avenida constitucion that included espinacas con garbanzos, paella, patatas, y tintos de verano. From Madrid to Córdoba to Cadiz, Spain has definitely gone green! One of the first things I saw on the plane into Madrid were energy wind plants all over the green mountains and land. Traveling from Madrid to cordoba I saw solar panels as well as many more energy plants. Universidad de Loyola Andalucia in Córdoba practices many green techniques especially in their newer building. However the Córdoba campus hasn’t gotten rid of water bottles quite yet. 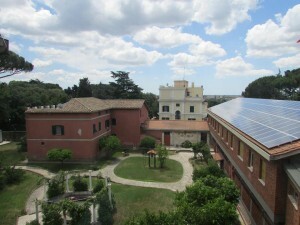 The campus in Sevilla has buildings that have received the platinum award for their green buildings. The building provides 70% of the energy it uses with its own solar panels and other green ways. The building will be open for students the coming fall but everything from the tiles to wall material to bathrooms was picked to be as green as possible.